Glenmorangie Milsean Limited Edition Single Malt has aromas quite sweet and rich, evoking candied fruits with a characteristic sweetness. Glenmorangie Milsean is the seventh edition of the Private Edition range, after the Tùsail expression of 2015. Limited to one bottle per order. Master Blender Dr Bill Lumsden and team of Glenmorangie distillery have explored once again the subtleties of whisky maturation, with a 2016 special finish reminiscent of the wonderful old confectionery shops, displaying bocals filled up with candies, caramels, candied fruits and amazing perfumes. Milsean stands for "The Sweet Things" in Scottish Gaelic and is pronounced "meel-shawn". After a first maturation in Bourbon casks, Glenmorangie Milsean has been transferred to original casks that previously contained Douro wine from Portugal, previously toasted-charred to deepen the amazing complexity of this expression. Quite anxious and carried away with what the results of the ageing might be, Dr Bill Lumsden has followed the maturation right from the start and has given great care to the complete evolution process of the spirit. After a few years ageing, the result is an amazing Single Malt, quite mellow and complex with sweet, luscious notes of candied fruits, of amazing sweetness, evoking a summer sorbet of ripe fruits and orange peel. The spirit shares common features with a dessert wine. 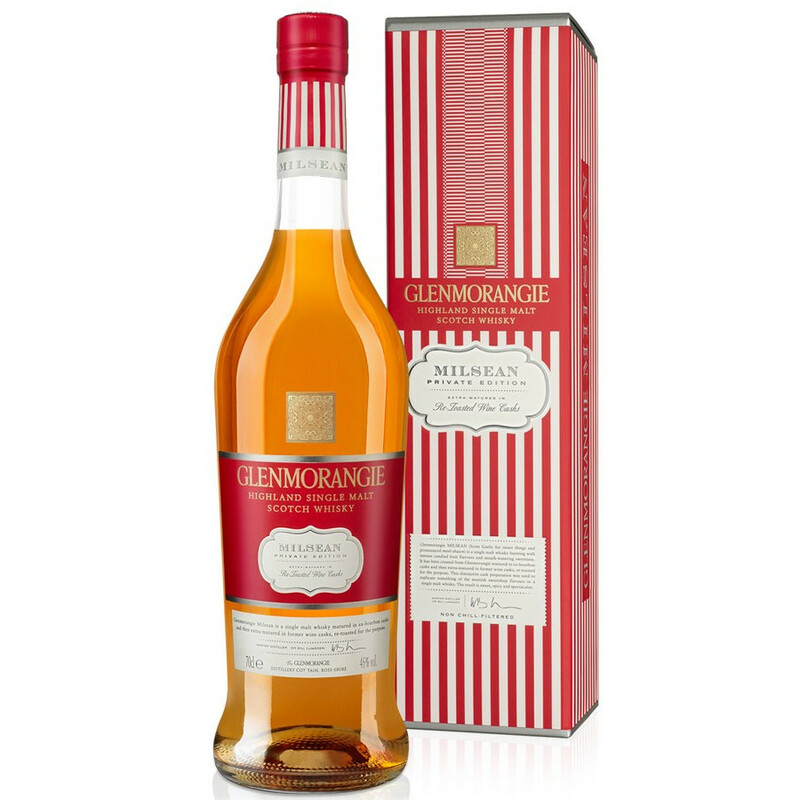 A limited edition of 5000 bottles worldwide, Glenmorangie Milsean is a luxury, rare Single Malt. Nose: particularly fragranced, sweet and spicy, with notes of sugar cane, ripe fruits, lemon sherbet and caramel. Palate: quite interesting with an oily, thick texture coating the palate and revealing spicy perfumes of allspice, giving way to a gentle, lush sweetness of sugar. Fruits are overflowing with a lovely tanginess of candied orange peel, cherry, peach, tangerines, plums and melon. Finish: of great length, quite spicy with a sweetened undertone, revealing notes of ginger, demerara sugar, blond tobacco and batter.